We are each born with individual gifts. In a world of disabilities we each must use these gifts to our advantage or run the risk of getting lost in the crowd. Made by M.E. 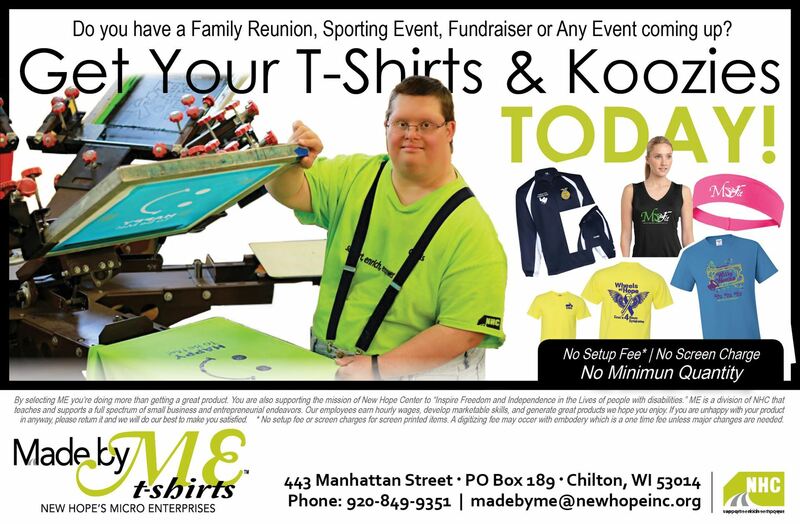 t-shirts at New Hope Center in Chilton Wisconsin offers screen printing and heat press sublimation print services to people and organizations everywhere. Our people can create single or multi-colored screen printed apparel and specialty items with your custom design or company logo for your next group or special event. From bags and ball caps to hoodies, polo-shirts, t-shirts, towels and so much more. The possibilities are endless. By choosing Made by M.E. t-shirts products, you support, enrich, and empower our client's independence through a micro enterprise whose focus highlights people’s gifts instead of disabilities. By purchasing our products you are supporting the belief that all people deserve to be participants in their communities, build lasting relationships with peers and neighbors, and access the opportunities promised to us all. Celebrate the uniqueness in all people. Inspire every person’s gift.